4.1 out of 5 based on 80 bloggers and 19 commenters. Notebook 2.0 is a free blogger template with 3 columns, left and right sidebars, grunge style and vintage style. Absract piece of work i like this very much innovative idea. @RaindropSoup You can find the answer to your questions and more in our FAQ section. @ayik pemulutan You can find the answer to your questions and more in our FAQ section. Buenas tardes! La plantilla es preciosa!!! sólo que se me presenta un inconveniente: al subirla a mi blog la parte del header no aparece, lo cual me da mucha pena porque me encantaba ese diseño, por favor si me podés asesorar te agradecería, ya que no entiendo mucho del tema. Saludos!!!! @Natalia: ¿A qué parte del header te refieres? Acabo de checkear tu blog, y se ve bien. Lo único que no aparece es el menú. Sin embargo, éste debería aparecer automáticamente cuando creas nuevas páginas. Creo que si no aparece, es porque quizás hiciste alguna modificación en tu blog. Eso lo intuyo porque en tu blog hay un scroll que en el demo no aparece. can i make the template smaller? coz if my monitor 1024×768, it makes scroll under the browser page. Hey first of all Thanks for Template. 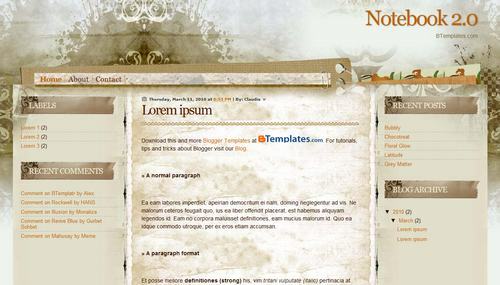 Template is appropriate for my blog but I want to align my blog title at center, it comes at right side..plz help me!! I love this blog, I just wish there were some more edits available for it and the widths were adjustable. I also have one Image link that won’t show up correctly, but worked just fine before hand. Hi, thanx for this template! I love it! Is it possible to fix the “Read more” button? I just tried to upload this template on my test blog and half way down the page I am getting some kind of ‘image disturbance’. How can I fix this? I also tried to follow the instructions to get the navbar back and it didn’t work.